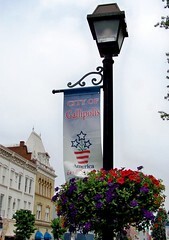 GALLIPOLIS — After months of anxious waiting, winners of the prestigious 2011 America in Bloom national awards program were announced at the annual awards held in Washington, DC on October 8. America in Bloom executive director, Laura Kunkle, said, “Many towns tell us that they win just by participating. The program helps them step up involvement of residents, businesses, and the municipality to work on visible improvements.” Gallipolis was judged on eight criteria: tidiness, community involvement, environmental awareness, heritage, urban forestry, landscape, floral displays, and turf and groundcovers across three sectors: municipal, residential, and commercial. Specially trained judges visited towns of similar populations and spent two days touring the town, meeting municipal officials, residents, and volunteers. Competitors in this category also included Demopolis, AL; Greendale, IN; and London, KY.
Gallipolis won the 4,000 to 10,000 population category and received a four bloom rating with special recognition for heritage preservation. In addition,they received an award for the best adaptive reuse project for the extensive, cooperative efforts to restore the Ariel-Ann Carson Dater Performing Arts Centre. Registrations for the 2012 national awards program can be submitted until February 28, 2012.